Hanoi (VNA) - Ho Chi Minh City authorities will create favourable conditions for enterprises from New Zealand to invest in and enhance trade cooperation with local firms, especially in education, innovation, development of smart cities, dairy processing, said Vice Chairman of the municipal People’s Committee Le Thanh Liem on March 27. During a reception for CEO of the New Zealand Trade and Enterprise (NZTE) Peter Chrisp in the city, Liem expressed his joy at the presence of more and more businesses and products from New Zealand in the city. Briefing the guest on local socio-economic development, Liem highlighted the great potential for the Vietnamese city and New Zealand to promote cooperation, especially in education, trade and investment. 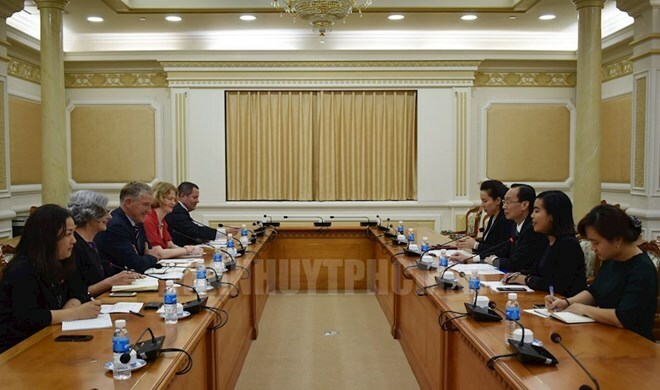 He hoped that Chrisp will make more effective contributions to boosting cooperation between New Zealand and Vietnam in general and Ho Chi Minh City in particular. Chrisp, for his part, said that he is happy that more and more Vietnamese students are pursuing their study in New Zealand, manifesting the close cooperation between the two nations. The Government of New Zealand always treasures ties with Vietnam as an important trade partner and a potential market that his country can provide various products, he stressed. Enterprises of New Zealand have many strengths and experience in investment cooperation abroad, he highlighted, adding that the development of New Zealand firms in Vietnam brings benefits to both countries.